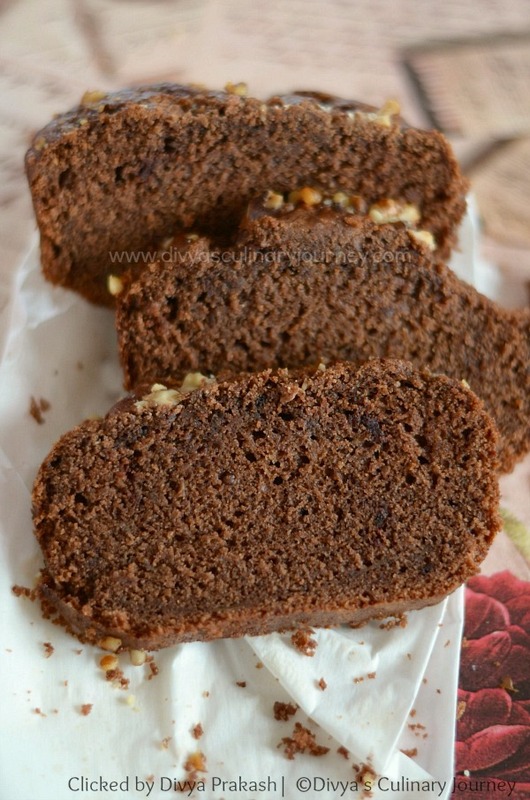 Today I am going to share Chocolate Banana Bread Recipe. 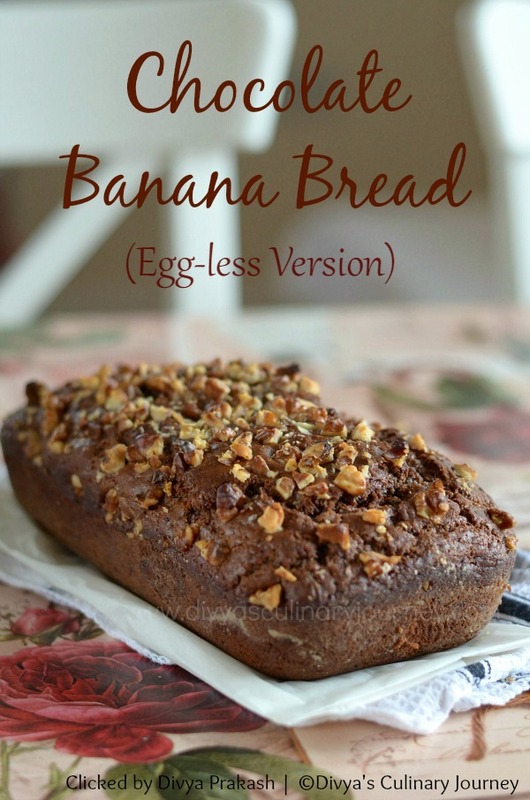 It is a quick bread made with bananas and cocoa powder, also it is Eggless. I had some over ripe bananas and I was planning to bake Eggless Banana muffins. But my son demanded chocolate cake so I had to change my plan and make Eggless Chocolate Banana bread. It came out very well - so soft and chocolate'y. When he came back from school and saw the chocolate banana bread, he was so happy and he loved its taste too. Instant Coffee Powder, 1 teaspoon. 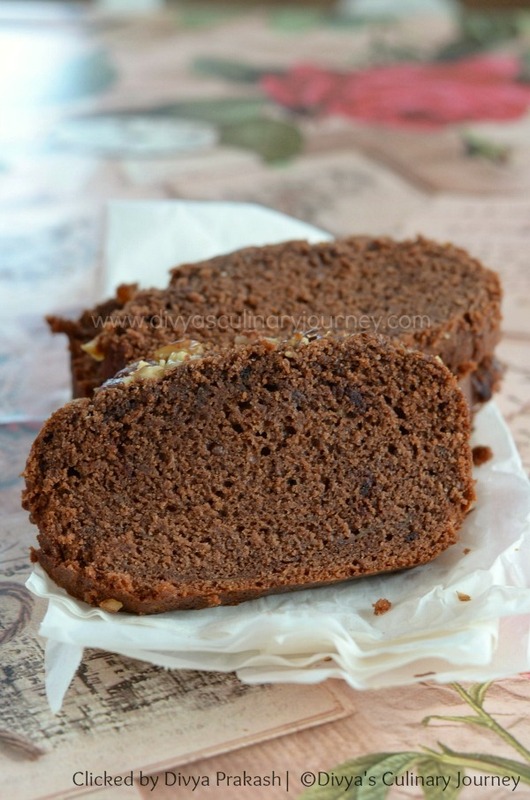 How to make Chocolate Banana Bread? Mash the bananas well and keep it ready. In a bowl, sift together all purpose flour, cocoa powder, baking soda, baking powder and salt. To this add Instant coffee granules, mix well and keep it aside. In another bowl, mix yogurt and sugar well. To this add oil, milk and vanilla extract and mix well. Then add mashed bananas and mix well. Add this wet ingredients mixture to the dry ingredients bowl little by little and keep mixing till they are fully incorporated. Preheat the oven to 350 F. Prepare the loaf pan by applying oil and flouring it. Transfer the prepared batter to the loaf pan and sprinkle chopped walnuts on top and bake it for 45 minutes till the tooth pick inserted comes out clean. Let the bread cool before removing from the loaf pan. Let it cool completely then slice and serve it. Baking time varies with oven. Check yours accordingly. Adding walnuts is optional. You can sprinkle them on top like I have done or even you can mix them in the batter. You can use other nuts of your choice too. The same batter can be used to bake muffins, just use muffin pan. It might take 25 to 30 minutes. Yummy bread.. looks soft and moist! Loving the pics divya.. espcly the addition of coffee powder which i hv never done s a sooperb kick to this cake..
love the pics,very tempting ones..yummy bread ! Bread looks awesome, perfect texture..
Can I use microwave to bake this? If yes, pls guide me on the settings.Thanks! I have not tried baking this in microwave and also I am not sure if it will work out in microqwave. Can't help you in this. Sorry about that. Hi, can I opt out on the coffee powder? Will if affect the cake other than taste?